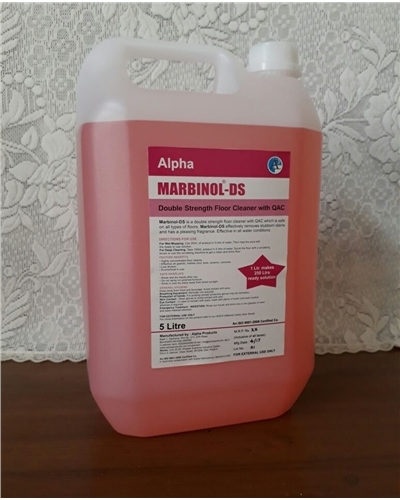 MARBINOL - DS is a double strenth floor cleaner with QAC which is safe on all types of floors. MARBINOL - DS effecively removes stubborn stains and has a pleasing fragrance. Effective in all water conditions. For Wet Mopping : Use 20 ml of product in 5 liter of water. Then mop the area with the ready to use solution. For Deep Cleaning : Take 100 ml product in 5 liter of water. Scrub the floor with a scrubbing brush or use the scrubbing mchine to get a shiny floor. Effective on granite, marble, vinyl, kota, ceramic, concrete. Rainse and dry hands after use. Do not spray on polished furniture. Breathing Equipment : Normally not required. Skin Contact : Wear gloves to avoid contact with skin. Eye Contact : In case of contact with eyes , wash with plenty of water and seek medical attention if required. Emergency Treatment : INGESTION : Rinse oyt mouth and drink one or two glasses of water and seek medical attention.